33 Heart's Desire (also called Soul Urge) - Your attention is directed to helping and caring for those you love. You are extremely loyal and rarely let anyone down. You need to feel appreciation for your giving and caring. You want to know that you are needed. You are generous and very forgiving. You are somehow able to overlook the worst mistakes in another and find enough good in that person to continue the relationship. You are patient, warm, and sympathetic, sometimes to the point of sentimentality. You have a natural ability as a counselor and healer. You are an excellent listener, compassionate and understanding. You are able to both sympathize and empathize with a person's dilemma. Your challenge as a counselor is to be adequately educated so that you can do more than provide a sympathetic ear or shoulder. You possess a great deal of artistic talent, though you may not have a lot of confidence in your ability. Art gives you a great deal of pleasure and satisfaction. You are especially sensitive to your environment and have a knack for creating an artistic, healing, and harmonious atmosphere in your home or work space. Although you are also a 6 (33 reduces to 6). 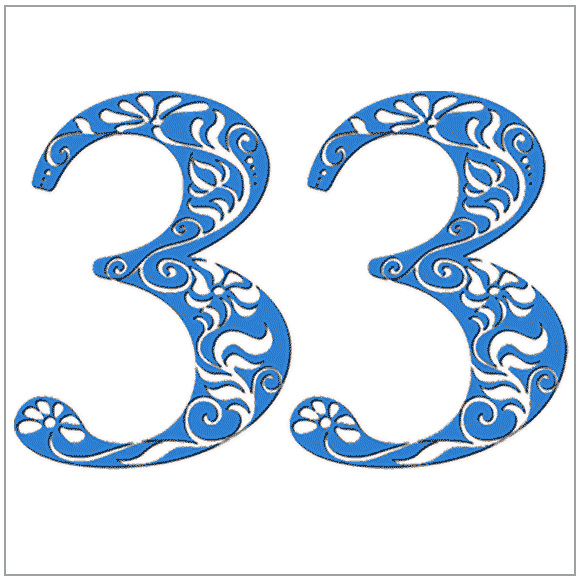 the added attributes of the 33 Master Number are generally not visible until at least age 35, and can lay dormant even longer. Still, you carry its potential - the compassion and intuitive intelligence that can help you become a powerful and beneficial influence in the world. It is not uncommon for a person with your Heart's Desire number to enter politics later in life, or to become involved in a large project to which you are emotionally drawn. I have used your numerology programs for almost 4 years now and I have to say that the reports are awesome. Dead on in most cases. I have had your numerology audio courses when they were just on tapes...and those are great too. I still refer back to them often.